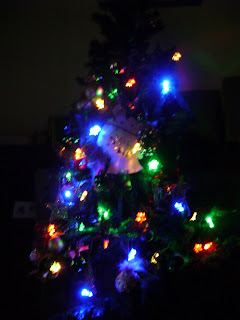 Christmas tree with the lights on (8 AA batteries needed) in the dark.. Playing catch up here!! So bare with me!! Hubby and i recieved a lovely gift this year of a kettle bbq just before christmas. A great suprise being that well, we had been thinking and planning on getting one... probably would have settled for some cheap one from k-mart had we found one.. 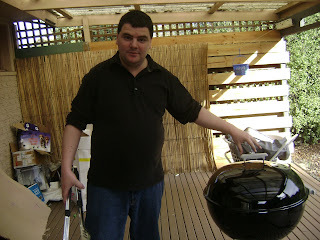 But instead we were blessed with a big Weber kettle bbq! It meant christmas cooking would be smooth and the heat outdoors (not that it matter we had a very mild christmas day may have reached 25deg cel? 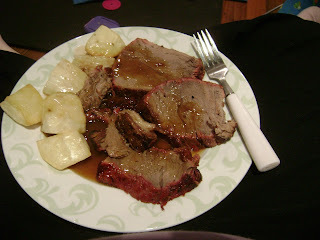 The meat on the test run was a lovely bolar blade from the butchers. The woolworths roasts i found had to little fat on the top than i wanted.. 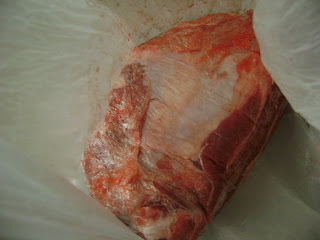 I am learning that my butcher has far superior quality of meats than the supermarket/safeway woolies. And i love my butchers diet mince for $9.95 a kg or 2kgs for $16? It truly is diet mince, none of this stuffing around with star ratings that coles and woolworths offer.. anyways getting off track. The end product, was delish!!!!! I requested more! (that is more frequent roasts. Not more on my plate) hhehehehe!!! The photo's of the tree and plate of food are effective with dark backgrounds.. because your blog background is black..and so the coloured lights and the light coloured plate seem to be 'suspended' (as in.. "in space") on your blog.. it's quite effective.. hope you get what I mean? The BBQ kettle looks beaut and I've taken notice of your 'Butcher Bolar Blade' comment back when you mentioned it on Twitter. I plan on getting Bolar Blade when I test my slow cooker and it's good to know to try for the butcher version rather than the supermarket version? How much would you have paid for that hunk of meat? I can't stand excess cardboard either and have struggled to dispose of it..with carpal tunnel and then the surgery.. trying to sometimes rip the stuff to get it to fit into the bin! My hands/wrists have been too weak. At these units we have smalllll bins.. and we fill up our bins.. all colours..so quickly! I miss big house-sized bins!